Art Deco cufflinks with diamonds, circa 1930. April is traditionally a quiet month in the estate jewelry trade. After the hubbub of the holiday season and the first quarter rush of post-Christmas self-purchasers, Valentine's Day gift givers and early bridal shoppers, the relative quiet of April is a welcome pause. It gives me a chance to travel a little, tackle some projects outside the gallery, and in general relax. One of the projects I undertook during this brief sabbatical was to organize and update the articles I have written over the years about antique cufflinks and other estate jewels. To make the articles more readily accessible and help a broader audience find them I have created an online library at www.ElegantCufflink.com. Although the library currently includes only about a half dozen articles, I will be posting additional articles in the coming weeks. I plan to have the online library fully "stocked" by the end of summer. Meanwhile, I hope you find the articles enjoyable and informative. As always, if you have any suggestions, questions, or comments, just send me a note through this blog or to my email address - arthur@jewelryexpert.com. Recent additions to the Antique Cufflink Gallery include an elegant pair of Carrington onyx and diamond cufflinks, Art Deco cufflinks with an endless tangle of squiggles, shimmering cat's eyes set in mid century cufflinks by L.E. Garrigus and fraternal cufflinks from the Benevolent and Protective Order of the Elks. Onyx and Diamond Black onyx set with sparkling diamonds is perhaps the epitome of Art Deco elegance. 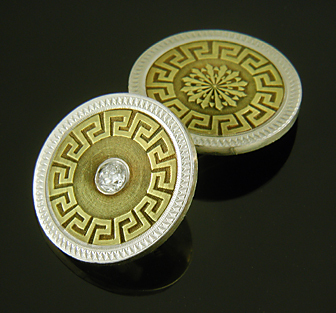 These beautifully crafted cufflinks were created by Carrington & Co. in 14kt gold around 1925. In the Antique Stickpin Gallery recent additions include a striking Egyptian Revival stickpin by Hans Brassler, an elegant Belle Epoque stickpin from France and a roaring lion with fiery ruby eyes. Belle Epoque A beautifully designed French stickpin from the Belle Epoque period set with sparkling rose-cut diamonds, a luminous pearl and bright ruby. Finely crafted in 18kt gold and platinum, circa 1900.